We featured a few holiday firsts last year, and have since dug up a few more to further clutter your mind in between shopping trips. In New York City, the holiday season officially kicks off each year with the ceremonial lighting of a towering Norway spruce in Rockefeller Plaza. Decked out with some 30,000 lights, thousands of folks line up in the cold to watch the illumination live, while millions more worldwide witness it on TV and via the Internet. The very first Christmas tree erected in that spot was not as ornamental but was probably much more meaningful. Back in 1929, the stock market crashed and America was launched into the Great Depression. John D. Rockefeller, Jr. owned a $91 million piece of property in Midtown Manhattan that he decided to develop, despite the economy and glut of vacant properties in New York. Ground was broken that year and construction began on a series of buildings that would include Radio City Music Hall and the RCA building. 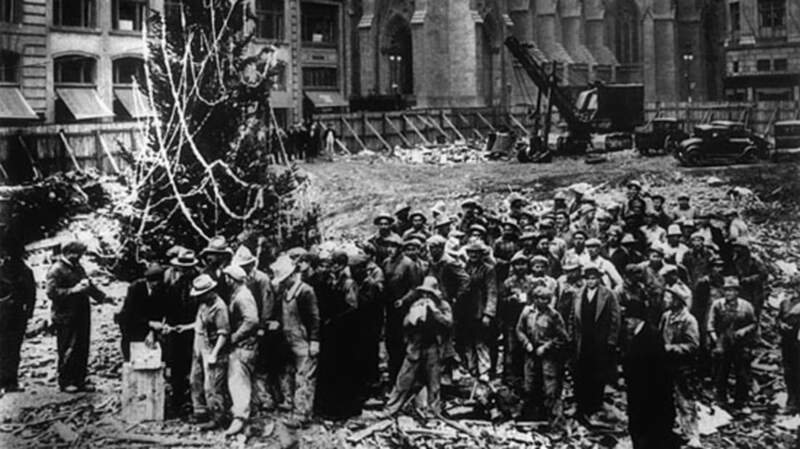 On December 24, 1931, with 64% of New York-area construction workers jobless, those who were employed on the Rockefeller project were so thankful to be working that they placed a twenty-foot balsam fir tree in the muddy building site. They decorated it with paper garlands and tin cans, and later that day lined up in front of it to receive their paychecks. The “Yule Log” was the brainchild of WPIX-New York station manager Fred Thrower. Hoping to give apartment-dwelling Gothamites the aura of an old-fashioned country Christmas, he hit on the idea of filming a cheerfully burning fireplace and broadcasting it. The original Yule log was filmed at Gracie Mansion, home of Governor John Lindsay at the time. The crew decided the fireplace looked better without the protective screen in front, so they removed it. Unfortunately, although they captured the desired film footage, they also caused fire damage to an imported rug. The 17-second film was looped and played for two hours every Christmas morning from 1966 until 1989, with a selection of traditional carols played in the background. Despite impressive ratings — the log consistently won its timeslot in the overnight Nielsens — it was retired in 1989, and was only recently resurrected thanks to a flurry of protests and petitions from virtual fireplace fans. The original footage deteriorated after a time, and when a new film was required, Gracie Mansion officials, remembering their charred carpet, invited the crew to look elsewhere for a suitable fireplace. Coca-Cola execs know that their company was not the first to use Kris Kringle to hawk their wares, but they don’t go out of their way to correct that long-circulated rumor. That particular honor belonged to White Rock Beverages. In fact, the White Rock folks were so forward-thinking in their promotion that their 1915 ad showed St. Nick delivering the company’s mineral water via horseless, er, reindeerless carriage, still something of a newfangled invention at the time. Store-bought Christmas tree ornaments first became popular in the U.S. when F.W. Woolworth started selling imported German ornaments in his chain of five-and-dime stores in 1880. Ten years later, Woolworth was selling $25 million worth of ornaments during the holiday season. Germany remained the major supplier of elaborate ornaments featuring spun-glass angels and blown-glass flower baskets until 1925. Japan and Czechoslovakia entered the fray that year, and thanks to the competition the decorations became more elaborate and the prices comparatively lower. The U.S. didn’t get actively involved in Christmas tree décor business until 1939, when Corning engineers found that with a few tweaks they could use a machine designed to make light bulbs to produce 2,000 ornaments per minute. Nevertheless, it took Hallmark 34 years to capitalize on the collectible aspect of Christmas tree ornaments. The company launched its first set of Keepsake Ornaments in 1973, with six glass ball and 12 yarn-figure decorations.